Chile national football coach Reinaldo Rueda said Monday he expects a tight match with South Korea, considering the quality of the two teams. Chile will face South Korea at Suwon World Cup Stadium in Suwon, south of Seoul, on Tuesday. It will be their second contest in men's football. "It's going to be an interesting match," he said. "Considering the quality of the South Korean national team, it's going to be a tight match. We're also a good team, so both (teams) can get benefits from tomorrow's match." Rueda's side were supposed to play against Japan on Friday before coming to South Korea, but the friendly in Japan was cancelled due to the earthquake that struck Hokkaido. The 61-year-old Colombian said it changed his plans for the national team but that they will overcome the difficulties. "We call up 23 or 24 players and test them whenever there are friendly matches, but this time, it's pity that we couldn't do it after that natural disaster," he said. "Besides, South Korea have already warmed up through their previous match (against Costa Rica). Chile (have a) disadvantage considering that aspect, but it's something we need to overcome." Rueda said each team's level of concentration will make the difference in the match. "In order to run ahead and play better than the opponents, we have to maintain our concentration for 95 minutes," he said. "South Korea have shown strong mentality and fighting spirit, so we need to be aware of that. But Chile are also strong in those aspects, so I think concentration will be the key." 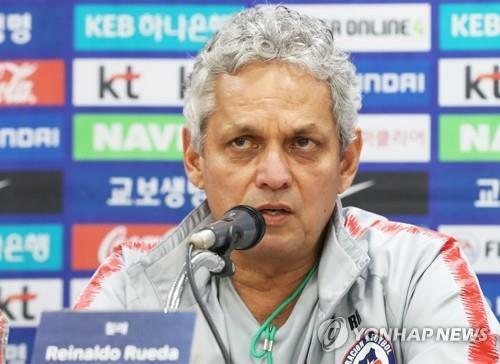 Rueda said he began analyzing the South Korean team before Chile began their trip to Asia. He expects that South Korea will progress with new head coach Paulo Bento. "At the World Cup, South Korea played good games against Mexico, Sweden and Germany, and they were dynamic," he said. "With (the) new coach, they will try to add new style and I believe South Korea can have success with (the) new coach." Rueda, who formerly led South American national teams like Colombia, Honduras and Ecuador, said Chile are in the process of rebuilding the team after failing to qualify for the 2018 FIFA World Cup. "Our short-term goal is to get a good result at the Copa America," he said. "For (the) long term, we're hoping that we can have solid pool of players in every position." Rueda's team arrived in South Korea on Saturday, but canceled training the next day. When asked why, Rueda said his players needed some rest after difficult times in Japan.